Bill's birthday was earlier this week, and I ended up making not one, but two cakes for his birthday. Why? Because Alex doesn't like cheesecake. Simple as that. Plus, I was feeling creative and two cakes just seemed like a perfectly normal thing to do. I also made a rather yummy dinner. More on that in a later post. Why is this cake "Super-Easy?" Because a) I used a boxed cake mix in the pantry, and b) I had a bag of frozen mango on hand and didn't have to go shopping for anything special. 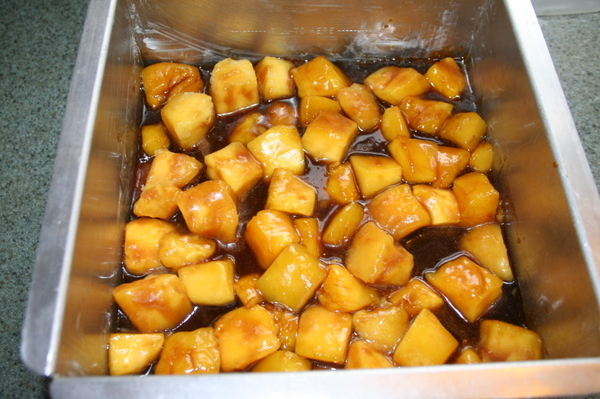 Okay, first, you put the 2 T of butter, 2 T white sugar and 1/2 cup brown sugar in a pan and melt everything together. 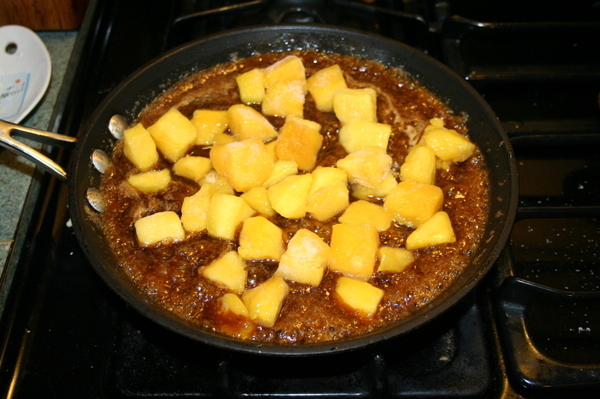 When it starts to bubble, add your mango chunks to the pan. Stir together and let it simmer a bit. 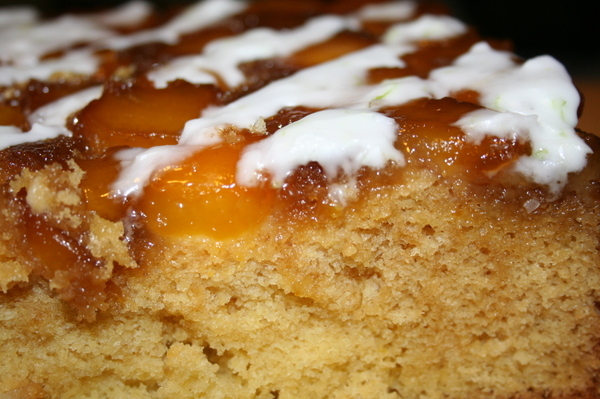 While the mangos simmer, grease the sides of your cake pan. 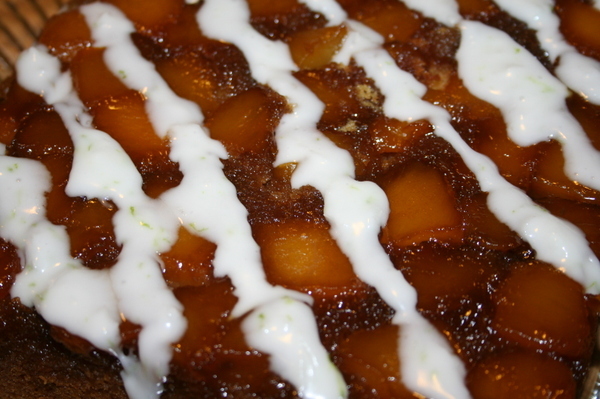 and, if necessary, rearrange the pieces of mango so they are distributed relatively evenly across the pan. You can let that sit while you mix up the cake batter per the instructions. Also - preheat your oven to 350 degrees F.
Pour your cake batter on top of the mangos and smooth it out with a spatula so the batter completely covers the mango layer. 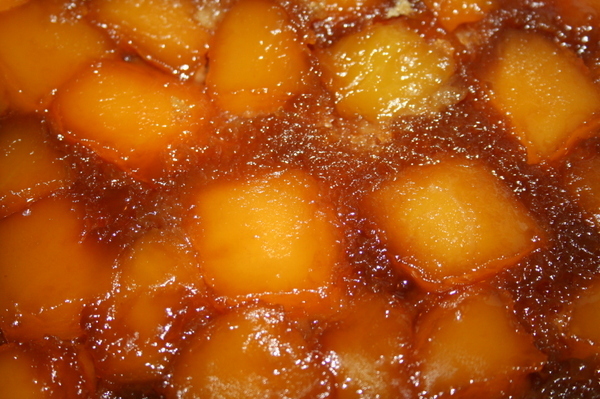 Be gentle - you want the mangos to stay on the bottom of the pan. Now pop that in the oven and bake until - you know - a knife inserted in the center comes out clean. This will take a while, as you're cooking more cake batter in the pan than if you were baking two layers. Figure on 45 minutes to an hour. But make sure you check with the knife. Let the cake cool on a rack for 20 minutes at least. Pick out a serving plate. Run a knife around the edge of the cake to make sure it's all separated from the sides of the pan. Now the fun part: Place the serving plate upside down on the pan. 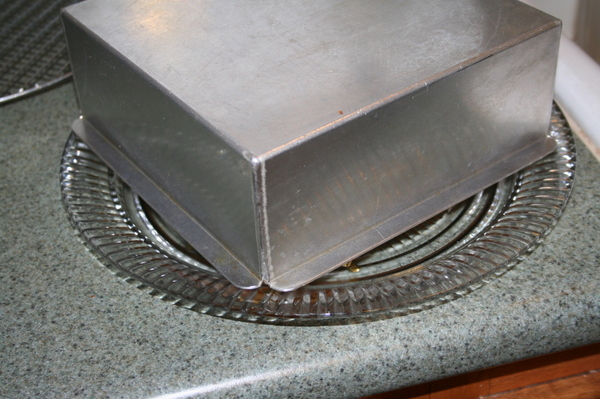 Hold the plate and cake pan together and after saying to yourself "nogutsnoglory," flip them over and set them back down on the counter. 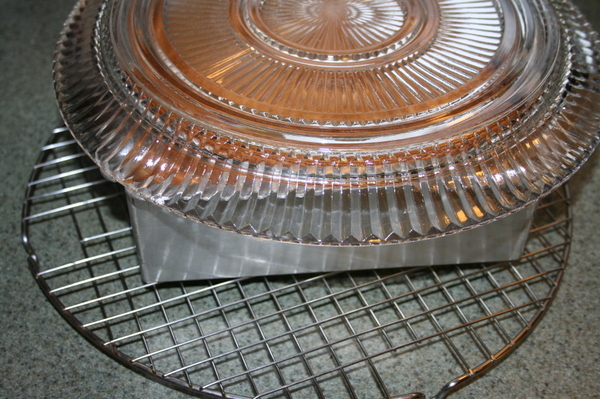 The cake pan should now be upside down and on top of the serving plate, and more importantly, you should have felt the cake release from the pan and land on the plate. and there you go. 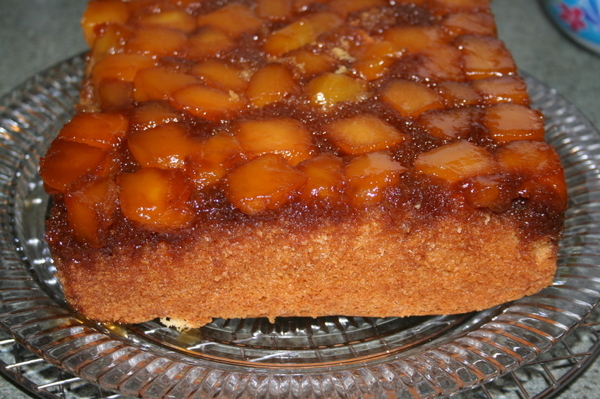 You can see a few stray cake crumbs up in the middle of the top of this cake (in the picture above) - a few pieces of mango stuck to the pan and I had to put them back on top, but you know what? They'll still taste the same. And it's not all that obvious unless you're self-critical like I am and you actually point it out to people. Let the cake finish cooling. So I figured we could make a glaze and Alex could drizzle that over the top and that would constitute the decorating. So I grated the zest from a lime. Why? I was thinking mango...tropical...lime... and so that's why. I put about 2 cups of confectioners sugar in a bowl and gradually added hot water while Alex stirred it together. I wanted a relatively thick glaze, and I added a bit too much water at first and had to add a bit more confectioners sugar to thicken it up. 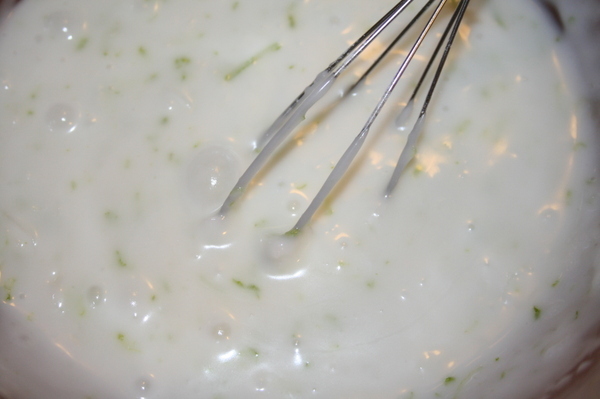 Then I added in the lime zest, vanilla and the shredded coconut and had Alex give it a final whisk. At that point Alex decided he didn't feel like decorating the cake after all. He said I could handle it, and hopped down from his chair and left the kitchen. 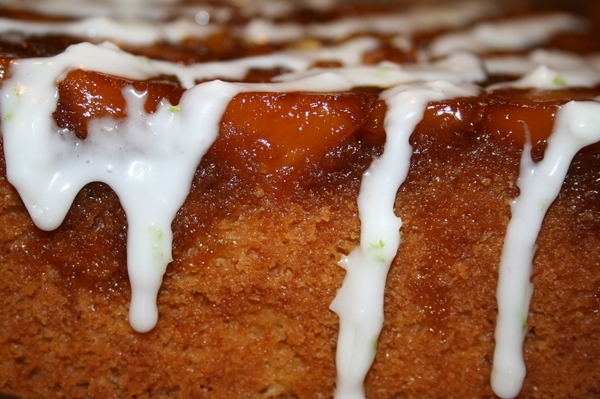 I just drizzled the glaze back and forth across the top of the cake on a diagonal, and decided that was enough. A few candles...a round of Happy Birthday (which we sang the way Alex's kindergarten class sings it - "Happy birthday to you, cha-cha-cha, Happy Birthday to you, cha-cha-cha...and so on...with accompanying hip-wiggling. It was kind of fun. )...and dessert was served. Alex didn't like the mango part. Julia wasn't really feeling well so she just had a little taste and said she was full. But Bill liked it, and so did I. 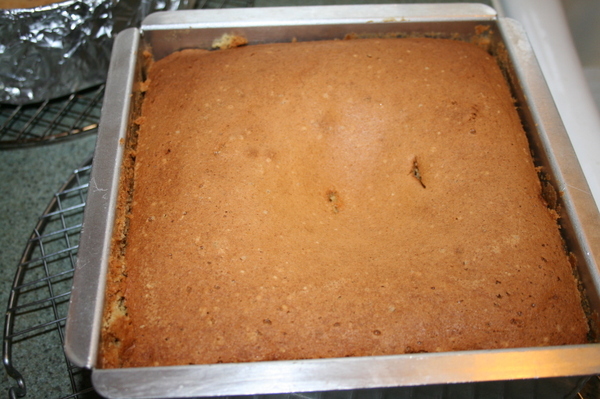 Some of the caramel part baked up into the cake, and the whole thing had a slightly dark, cooked sugary taste. Pretty yummy. And, like I said, super easy.